I'll never forget when we married off three daughters all in 11 months, and then my son left home and my wife and I found ourselves empty nesters. It was a change I hadn't anticipated being as difficult as it was, but it was a change that was necessary for their growth as well as ours. In the words of Charles Darwin, "It is not the strongest of the species that survive; nor the most intelligent, but the ones most responsive to change." One lesson I learned that day was that change will happen whether I like it or not. It's up to us whether that change becomes a catalyst for growth or the road block that brings our success to a screeching halt. This is true in virtually every facet of our lives. The reality that our market has changed must be faced by independent dealers and the vendors that serve them. We can continue to tell ourselves that our old way of doing things is good enough to carry us through, that our relationship with our customers is enough to insure our success, or we can rise to the occasion and ride the cusp of that change into the new market, with new perception, new abilities, new tools, and new vision. When asked what made him so successful; hockey great, Wayne Gretzky said, "Good hockey players skate to where the puck is; great hockey players skate to where the puck will be." If Digital Gateway can't see where the market is headed and provide the tools and partnerships that you need to help you get there, than what is there that sets us apart from our competition? In order to be effective in our mission of automating your world, we have to be not just one step, but often several steps ahead of a game that is always changing. That is what my people wake up for everyday. That is why we have invested 2 million dollars getting e-automate running on the .NET platform. In spite of the fact that 90% of companies who have attempted to make that transition have not survived, we knew that the future of your company and ours depended on a system that runs on the most advanced technology available to connect your world. That is why we spent so much time and money enabling e-automate to meet the new PCI DSS Standards. The advent of the Payment Card Industry Data Security Standard (PCI DSS) has brought greater awareness of data security issues, but many companies are still unfamiliar with the program. Any Company that stores processes or transmits credit or debit card data are required to comply with this standard. The consequences of not complying with this standard range from a $25,000 per month fine, to literally millions of dollars. The point is that with more than 230 requirements that must be met as part of this program, this is a serious concern for thousands of dealers as well as other companies all over the nation, including Digital Gateway. We knew that it was our job to help protect our more than 1000 dealers from experiencing the potentially catastrophic impact of not complying with this new standard. As CEO of Digital Gateway, I felt personally responsible to come up with a resolution, so I went to the source. I contacted a trusted expert who helped me track down Element Payment Services who is now a partner to help all e-automate users become PCI Compliant and protect their sensitive credit card data without breaking the bank to do it. Our dealers aren't the only ones that know that we are there for them. This past month, my executive team and I have put many hours into planning and making changes within Digital Gateway. The people that work here need to be confident that change is in the air for them as well and that as a company we are prepared to face the challenges that come our way. We have a vision of what we want to accomplish and who we can be and as we look forward to 2020 we will be focused on that vision. Change initiatives are underway to help facilitate personal, departmental, and complete company growth internally. Our dealers who attend the annual e-automate Users Group (EUG) this year will see that change and be a part of it. Juan Riboldi, an expert Change Consultant who has consulted with major corporations (such as IBM, Sony Pictures and General Mills) and who has recently completed a book based on a two year study of major changes within those organizations, will include members of the EUG in the initiatives that he is leading the Digital Gateway Organization in over the next several months. In light of that, I want to extend a personal invitation to all of our dealers to attend the EUG annual conference in September and participate with us in this incredible learning opportunity. Its changes like this that give us the confidence to apply Gretzky's quote to Digital Gateway. We want to step into high gear, not the next gear. We must be crystal clear as we move toward our 2020 Vision and that vision must align with our customer's needs and go beyond that to anticipate what they may not see coming. Venture capitalists may be able acquire the old industry leader, but a privately owned home grown company, isn't something that you can buy, the dedication and devotion of individuals who have put their hearts and their lives into this business and are committed to your success isn't something that you can purchase. We will always have the best interest of our dealers at heart because we know that our success depends on your success. In a world that is ever changing, we are committed to bring our dealers the tools and information they need to skate to where the puck will be. Just over one year ago Digital Gateway formally organized The Account Management department. A new department specifically focused on working with current customers after they go live. The purpose of the account management team is to work with you and your company to optimize the e-automate solutions you already own and introduce to you features and solutions you may not know about that will increase your business efficiency and cut unnecessary costs in your business. We're not customer care or training, but we can help with just about everything else. From billing questions to e-automate database checkups to understanding which areas of e-automate will provide the highest return for the time invested in getting them operational, we can and want to help. One of the more powerful tools available to the account management team is the Digital MRI. Its purpose is the same as a medical MRI; to perform an in-depth scan that will reveal potential areas of concern not visible to the naked eye. The account management team has performed over 180 digital MRI's over the last six months. After each one the account manager writes a prioritized action plan for the customer that identifies which areas of e-automate that, if focused on, would provide the highest return on investment for the time or money invested. One customer we worked with had owned remote tech for three years but had not launched it. After seeing the ROI they were missing out on, a plan was quickly created by the account manager and executed by the dealer. Now, Sixty days later it is operational and they are starting to see the return. If you are not taking advantage of the Account Management Team we have created please start today. Each customer is assigned a specific account manager after being a customer for nine months. If you don't know who your account manager is or have not had a Digital MRI ran on your database please call us. We are here to help. CEO Juice is all about automated processes for the copier industry. Since they only work with e-automate users CEO Juice is able to focus exclusively on providing further alerts and monitoring of the information inside e-automate. CEO Juice Partner Mike Kirkpatrick told us, "Our service is designed to be ongoing where we add alerts and tweak existing ones as new problems arise or as the company changes direction. We handle everything, installation and support, provide the software needed and offer a money-back guarantee… all for less than a typical utilities bill." Parts Now! is the industry leader in profitable solutions for businesses who service laser printers. The #1 supplier of laser printer parts in North America, Parts Now! helps thousands of companies generate more profit in every segment of their business with services and products like technician repair training, premium-quality compatible toner and a true turnkey managed print solution, to name a few. Not only will you find the parts, but the smarts to help your business succeed! ITEX 2010, An Economic Indicator for the Office Equipment Market? We all know that the "new market" is much slower than what we experienced in 2006 and 2007, but how does that translate to the Office Equipment Market in 2010? Market-specific trade shows, like ITEX, are often good economic indicators for their market. The focused interests of those who attended ITEX this year can tell us something about the economic condition of our industry. The Focus and theme of ITEX 2010 was MPS. This generated strong interest from many attendees, and seems to be a theme of continued interest as dealers strategize for the future of their business. Laura Kitner, compared MPS adoption to the adoption of color output "We heard about the growth projections of color output for years before it really took off. We are observing the same behavior with MPS. The data for MPS indicates that the adoption is well into the adoption curve." Laura's words were confirmed by the attendees at ITEX: The copier and printer manufactures were aggressively rolling out their MPS programs. Consultants have aligned with the manufactures to provide the training and oversight to the market to sell and support MPS. The best way to describe my observations about how independent dealers experienced ITEX is to share with you the activities from our booth. To borrow a term we used at my Dad's garage when I worked for him as a teen, "We were three deep!" meaning, that for each DGI employee in the booth we had 3 people in line waiting to talk to us! The majority of these people were from dealerships that were in various phases of "getting into MPS". The key element revealed by the dealers was the critical need for e-automate to integrate with the suppliers that they depend upon to make MPS work. Each of our ITEX partners represent those critical suppliers. We were proud to be surrounded by LMI, Supplies Network, Great America, FM Audit, Saleschain and Relevant Automation. "We're eager to make a positive impact within the elite dealer network DGI has created -this new level of connectivity and support has been carefully designed to help each dealer grow their business and maximize their profits right away," stated Gary Willert, CEO of LMI Solutions Inc. In summary, the economy may still be slow, but based on the activity at ITEX 2010 it is picking up in our market. We sincerely thank our customers and partners for playing such integral roles at this year's ITEX! 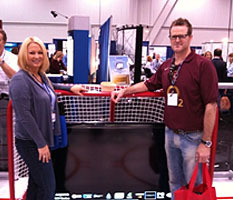 The winner of our give away, a 60 inch Flat screen plasma TV, was none other than Todd Moody from KBA Docusys; one of our long time valued customers. As many of you are aware we've been working diligently on converting our e-automate system from our Visual Basic platform (old & busted) to C# .NET (new hotness), it has been a long process, once completed, will ensure that your current e-automate system will be up-to-snuff with the latest software platforms in the world. What this means to you is that your e-automate system will not die a slow painful death from being technologically irrelevant (like some of the products competing against e-automate…), instead e-automate joins the rest of the geeky legions in being able to embrace and incorporate the latest and best technologies our market and the world have to offer you! Well enough of the "rah-rah", I bet many of you are saying "well that's all fine and well, thanks for making sure the product I paid for isn't going to be wearing the proverbial adult diapers and eating tapioca next year, but when the $@#% are you going to get back to delivering features for my e-automate system!?" Well I have good news, maybe not exactly what you were expecting, but I can tell you that we know how you feel, that we care and we have acted. As mentioned above we can't deliver on new features in e-automate just yet, but we will be delivering on some considerable features for e-automate and they come in the shape and color of two new core add-ons, the Contract Import Utility and Contract Analytics! Now before you groan, the term "core add-ons" comes from the original greek meaning "modules that will directly benefit e-automate and *drum roll*, will both be no-charge (free) add-ons to your e-automate system!" Allow me to introduce these two add-ons to those of you who weren't able to attend the last e-automate User's Group meeting. Contract analytics will also include several reports that focus on contract profitability and volumes on contracts. All-in-all we provide you with the tools, you provide the talent to conceive and execute the potentially thousands of ways you can slice and dice the data now available from the Contract Analytics add-on. Our intention is to ultimately provide you with a much deeper understanding of where your business is "bringing in the bacon" on contracts and where it needs to "cut the fat." To conclude, from all of us at Digital Gateway, we hope that the effort put towards the above core add-ons will be of great benefit to all of you. The plan is to make both of these add-ons available to the customer base this year. January 2010- Digital Gateway(DGI), makers of e-automate are pleased to announce that ASI Business Solutions has joined with the majority of the Select Dealer Group (SDG) in becoming e-automate users. Founded in 1989 by Ken Copeland and Scott Wiggins ASI has grown to become one of the largest office equipment companies in the Dallas area and has been recognized nationally as an eight time winner of the Elite Dealer award by Office Dealer Magazine. "With the number of SDG members now using e-automate the time was right for us to convert to e-automate." said Scott Wiggins, Executive Vice President of ASI Business Solutions, "e-automate is more user friendly, easier to extract information for reporting, and we feel it will help us streamline our business processes, thus requiring far less labor hours to process our business. We are now better positioned with the right business software for the future of our industry as we continue to integrate MPS into our business model." As former president of the SDG, Scott Wiggins got up close and personal with Digital Gateway as they held their annual meeting in the Rocky Mountains near DGI headquarters. "Now that almost all of the SDG is using e-automate, it puts Digital Gateway in the unique position of being able to work more effectively with one of the copier dealers leading organizations," said Jim Philips, Digital Gateway's CEO. Duane Walker, the Director of Customer Care for Digital Gateway worked extensively with ASI before and after the conversion. "The process of converting from one software solution to another is never a pleasant experience, but DGI has worked hard to develop a system to make sure that it is as painless as possible," said Duane. "Our work with ASI Business Solutions helped us add incremental efficiencies to our already robust OMD conversion processes and tools. We are excited to continue building our relationship with them. Their dedication to customer satisfaction and their commitment to remain on the leading edge of technology makes them a company that we are proud to be supporting." I have a few things I wanted to share with everyone, so here goes. First my own shameless plug, and this has nothing to do with the EUG, I'd like to announce the arrival of my new grandson! He was born on 3/10. Mother and baby are doing well. For those of you too young to know what grand parenting is like, it truly is a blessing. I'll have pictures at the next meeting and I promise no more than one picture per PowerPoint presentation. Now on to the business topics. Just after our last meeting in October we ran a survey on the EUG web site. Based on the survey results, everyone truly enjoyed the meeting. A handful of the attendees commented on the internet access at the hotel being limited and slow. Since our last meeting the hotel has upgraded their internet bandwidth and addressed those concerns. The second largest concern was the readability of the presentation screens and rest assured that we are working to improve your experience there as well. Speaking as a person with much less than perfect eyesight, I can certainly understand the concerns there! Our Steering Committees are up and running full steam ahead. The job of the Steering Committees is to act as a liaison between the EUG and DGI concerning product enhancements. Every post for an enhancement on the EUG website is documented by the appropriate Steering Committee and placed in a priority list for consideration. The Steering Committee members also monitor the EUG blogs for enhancement ideas and operation issues. Results from the Steering Committees' interaction with DGI are discussed at the annual meeting (yet another reason to be there). If you are interested in becoming a member of a particular Steering Committee please check the EUG website menu under Committees > Steering Committees to contact the appropriate person. The membership and focus of each SC can be found there. The greatest benefit of EUG membership is the interaction with fellow EUG members who are willing to share their knowledge of e-automate to help others. The EUG website is currently home to 1021 members and is accessed on average at least 8000 times per month. That's a lot of people sharing knowledge that can't be found in any of the program's help topics. Membership is open to all users of e-automate under both an active maintenance and support agreement. For those companies that are not currently members of the EUG, we'd love to have you join our family. Click here to view our membership options. Finally, we feel a great part of our success comes from our annual meetings where e-automate users can interact with the key employees of DGI, DGI sponsored vendors, and network and connect with other users on how they use the product. Well, start packing your suitcases and making travel arrangements. We are now fully into the planning stages of the annual EUG meeting. For those of you who did not receive the email, the dates of the meeting are September 13th through 17th at the Red Lion Hotel in beautiful downtown Salt Lake City, Utah. We hope to see you all there. Tip: #1 Test fax - Remote Tech has a test fax function built-in. It requires little setup. The computer running e-agent needs to be connected to a modem and have the e-agent task "Test Fax" running. Two simple text files need to be created. One long text file and one short. I personally use the Declaration of Independence as my long fax. After that the technicians can send themselves test faxes through Remote Tech. Tip: #2 Know about both websites (LIVE VERSION) - Even if you are using blackberries or smart phones, make sure the technicians know about the website addresses. There are two websites. The plogin.aspx is the standard website used on the blackberry or smart phone for calls, field transfer, fax test, create calls, item lookup, and invoice info. There is a second website that is login.apsx. This website is for item lookup, time entry, call list, and create call. The second website is the only place to do time card entry. The reason for knowing the website address for the technicians is so that if they are out of coverage, they can still close calls by using a customer's computer or unplugging the copier and plugging in their laptop (if they have one). You can even go one step further by adding links to these sites on your website in a hidden location. Tip: #1 Take Control! The Inventory Logistics Console (a.k.a. "ILC") is your inventory "Control Center". Automate your purchase orders and transfers through out the day based on restocking levels, short orders, special orders, drop ships, and technician's part orders. It is designed to assist you in analyzing your inventory needs and in making decisions about how to meet those inventory needs by creating transfer orders or purchase orders. You can allow the console to auto-generate the necessary purchase and/or transfer orders, or simply transfer inventory to its appropriate location. You can collect inventory needs throughout the day and repeatedly analyze and add to pending purchase orders before you create all purchase orders or transfer orders needed at the end of the day. The e-agent task "Inventory Management" automates the Inventory Logistics Console. Keeping your technicians supplied to do their job and your customers with needed supplies do to theirs. The second option would be to watch our new training videos for the ILC. You can find these videos on our website on the Customer Resource Center under Training Videos. With the never ending quest for 52% GP in Service getting stronger and stronger, what technology can we use to leverage increasing profits? The first thing we should realize is that our labor cost goal is 27.5 % of service revenue, making it our most costly component. After consulting with dealers for the last five years, I would venture to say that the average dealer's labor expense is usually closer to 30% of service revenue. The cause - is often related to overstaffing necessary to offset under producing technicians. The Service Statistics report in e-automate reflects very clearly the average service calls per day as well as the number of Customer and Travel hours for each technician. When average service calls per day drop below four and productive hours per day (customer + travel hours) drop below seven, we must overstaff to offset those inefficiencies. Digital Gateway has just partnered with US Fleet Tracking to offer a GPS solution that will offer us a solution to increase productivity and lower travel time and mileage expense. Recent installations around the country have proven that mobile employees behave differently when we know where they are at all times. One dealership reported their first call dispatch time was thirty minutes earlier than before the first day the solution was implemented. But seeing where the service technicians are located is only half of the picture. At the recent ITEX show, USFT introduced an interface for e-automate that also integrates the locations of the service calls. Using dedicated GPS devices either hard wired into company vehicles or dash mounted units in technician owned vehicles - or even pager like units for technicians with walking territories - we are able to display on computer screens or even big screen displays the location of service technicians, as well as those service calls assigned to them on a satellite image. Using a color coding system, we are able to easily display the relationship between the technician and their assigned calls, enabling a dispatcher to proactively manage call loads and travel time. The use of true GPS devices eliminates the inaccuracies normally found with cell phones as well as problems with battery life. Further, the ten-second refresh rate provided by US Fleet Tracking gives a much more accurate report of miles driven, along with a more accurate rendering of vehicle locations. A series of reports as well as email alerts are available in either real time or historical playback to show miles driven, locations at any given time etc. for monitoring purposes. What about return on investment? When we consider the dealer's ability to improve first call dispatch times by thirty minutes, complete return on investment is accomplished in a matter of days. So what is the bottom line? If we can leverage technology to reduce travel time and increase billable customer time by as much as thirty minutes per day, we can lower our burden rate by as much as five to seven dollars per hour. For dealers with company owned vehicles we often see a reduction in fuel expense by as much as twenty percent. You can also expect a similar savings in mileage reimbursement for technician owned vehicles due to more accurate reporting of miles driven. I believe the real question is - can we afford not to leverage this type of technology, particularly when it increases productivity and reduces travel expense? Look for a series of webinars from Digital Gateway very soon to show how you can leverage this technology to improve your bottom line. Jim Phillips, the CEO of Digital Gateway, has always affirmed that dealers who buy e-automate are not buying software, they are buying a company. We believe that with all of our heart and that's why we feel that it is important for our customers, and all those who interact with e-automate, to know more about the people who are At the Heart of DGI. We want you to laugh with us at some of the outrageous office pranks we see on a regular basis, smile when you speak with a customer care representative that you recently learned loves to sing opera in the shower, and marvel at the genius of our employee made indoor miniature golf course at the DGI Mini Golf party. This section of our company newsletter is our way of sharing who we are with you. It may include a spotlight on one or more of our employees, funny things that our children say, office jokes or comics, pictures and stories surrounding office pranks or activities, and many other tidbits of information about the DGI family. Our hope is that through our interactions with you we all will come to realize that we are not just dealing with businesses, software, and policies; we are dealing with people, and in the words of the hokey pokey... "That's what it's all about!" Have you ever done the "Hurt Dance"? Yes, the Hurt Dance. The Hurt Dance is the bouncing, running, hoping, skipping and shake down you do when you inadvertently hurt yourself and cause yourself an incredible amount of pain. Come on… you know what I am talking about. 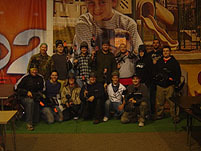 On January 30, 2010 employees of Digital Gateway had ample opportunity to hurt dance to their hearts content at our Annual Paintball Playoff. We competed in two teams with one goal in mind, to eliminate opponents by shooting them with speeding capsules of greasy paint (Hence the sting and the pain). The anticipation is a rush in and of itself! Playing in an indoor arena, teams start at opposite ends of the playing field and have full use of the entire field once the referee starts the game. Tanner Phillips, hiding out amid inflatable bunkers claimed that he single handedly shot everyone on the opposite team. John Peterson retreated to the posts to set up for a sniper shot. Even Daron Jones and Lon Price used strategic conspiring to shoot up the other team. All in all this was a fantastic time for employees of Digital Gateway to all come together to enjoy a good time. Plus, it never hurts to shoot a friend in the hand or finger with a paintball. Yeah, tell that to the guy "dancing" his way back to base. The DGI family just continues to grow! Kip Kugler, MPS Specialist and his wife Erin welcomed a new little baby boy to their family on March 24, at 11:47 PM. Owen Steven Kugler made his grand entrance into the world weighing 8.5 lbs and is 21 inches long. At that size it won't be long before his daddy and big brother Kashus will have him shooting layups like the best of them! Madeleine Joy Simonsen arrived on February 20th at 4:25 AM weighing 5lbs 14 oz. and 20 inches long. Proud daddy J.C. DGI's Software engineer told us "Madeleine likes to smile and to pout. She looks cute either way. Other hobbies include squirming, grunting and squeeking." Zachary Ryan Johnson, Son of Ryan Johnson, a DGI Software engineer was born April 16th sometime in the afternoon, blah blah blah, 8 pounds and about yea long, blah blah blah, poops a lot, cries a lot, but we still like him okay. Cruz Peter Garff was born on May 25, 2010 and was 7 lbs 15 oz and 22 inches. Daddy Shaun Garff, Customer Account Manager and his wife Faith have been up at Primary Children's Hospital in Salt Lake City ever since as he underwent heart surgery when he was one week old. He is recovering well and we are hoping they will be able to go home fairly soon. Kelly Craig was Born in Provo, UT. three months before his due date. Weighing 1lb 8oz. Kelly was undoubtedly a miracle baby. Perhaps that should have been a clue to his mother that she had a fighter on her hands. Kelly is one of three children with an older sister and a younger brother. After graduating high school he attended Snow Collage, Weber State and BYU in addition to POST Peace Officer Standards and Training (police Academy). Kelly married Ann Marie Farnsworth on 8/23/1990 and together they had 3 kids; Kaleb 18, Calen 16 and her royal worship Kira 13. Former Deputy Sheriff in Utah and Missouri, Kelly came to DGI to become a conversion consultant/ Trainer. We are still uncertain if his Martial Arts skills including a black belt in Karate help him in this position or not! Many times when he goes onsite for training or for onsite conversions, being a big strong guy and looking like a biker; he can be a little intimidating. Then the customers really find out that he is just a big teddy bear and very helpful and patient with them; so much so that the ladies onsite often give the big teddy bear a hug before he leaves town. But don't tell him we told you… he thinks he has us fooled into believing that he is mean, grumpy, and socially unacceptable! 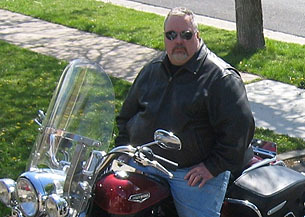 Kelly loves Motorcycles, Martial Arts, Shooting, all outdoor sports and wooing women (just his wife). He dreams of being able to do a back flip on a motorcycle. He has been a great addition to the DGI family and he told us "I enjoy almost all aspects of my job. I like that I can call almost everyone I work with a real friend and even family and that is what is great about DGI." I just hope he remembers that when our friendly Baloo realizes that I just gave him away for the friendly bear that we have come to know and love.